Mix the cheese and vanilla in a bowl. Set aside until you need it. Cut the peaches in half and get rid of the seeds. Cover the peaches with a little bit of canola oil to prevent them from sticking to the grill. Place the cut sides facedown on the grill for 3 to 4 minutes or until the peaches have heated. Fill the peaches with the mascarpone mixture and set aside to serve. Cover with caramel and serve. This recipe is easy to make on a grill, but if you don't have a grill simply place them on a baking dish and cook for 5 minutes or until they're hot. Summer is a great time to enjoy a large variety of seasonal summer fruits, like peaches, which I love. Do you like them too? 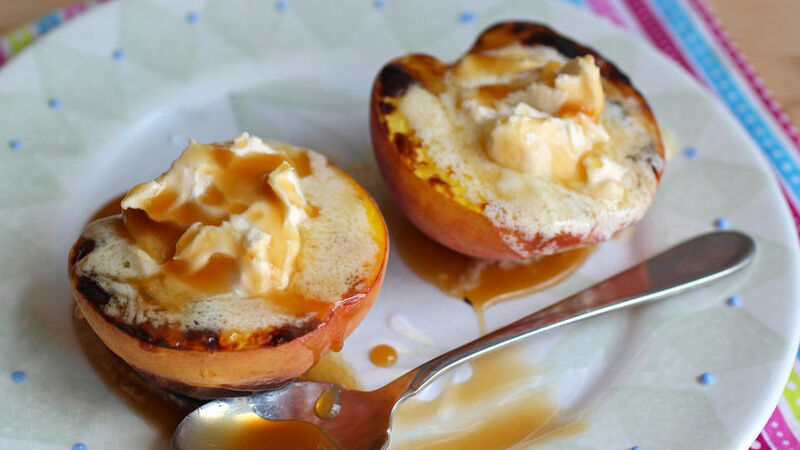 Well, then you must try these roasted peaches with mascarpone and caramel. They're perfect for warm day or when you don't have enough time to prepare a complicated dessert. This is an absolutely delicious dish, it's very easy to make and the best part is that it takes only 5 minutes to prepare.